Turmeric, or Curcuma longa, is an ancient spice popular in India and Asia as far back as 2,000 BC. A promising disease-preventive supplement due largely to its anti-inflammatory action. Protects against cognitive defects; reduce or prevent Arthritis; Healing benefits for the entire body. 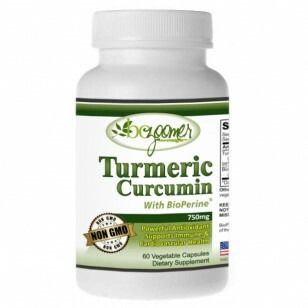 Our Turmeric has a special chemical compound called curcuminoids that are some of nature’s most powerful antioxidants. Turmeric-Curcumin supplements are also being researched for their effectiveness on Heart Disease and cancer. An amazing complement to our Organic Sulfur. May help to increase lifespan. It’s used in yellow mustard as well as a remarkable supplement. The smell of turmeric has orange and ginger overtones and it has always been used in curry dishes. Besides the healing properties, it tastes very good, and people use it for cooking to welcome the senses and make food more enjoyable. In our opinion, only essential oils are as excepted as Turmeric is today. The chemical compound curcumin is the key to turmeric’s healing power. Curcumin is derived from turmeric. There have been over 9,000 scientific articles published evaluating how effective curcumin is. The healing benefits are for the entire body. Turmeric is a bright, yellowish-green spice that comes from a root. You’ll usually be able to find this root here in powdered capsule form. It’s originally from south-east India but it’s now grown in different areas. In India, turmeric is used to make a topical compress for injuries and muscle strains. Water is mixed with the ground spice to make a paste then it’s covered with a cloth that is soaked in hot water. This process is utilizing the anti-inflammatory compounds of turmeric. Turmeric has a special chemical compound called curcuminoids that are some of nature’s most powerful antioxidants. 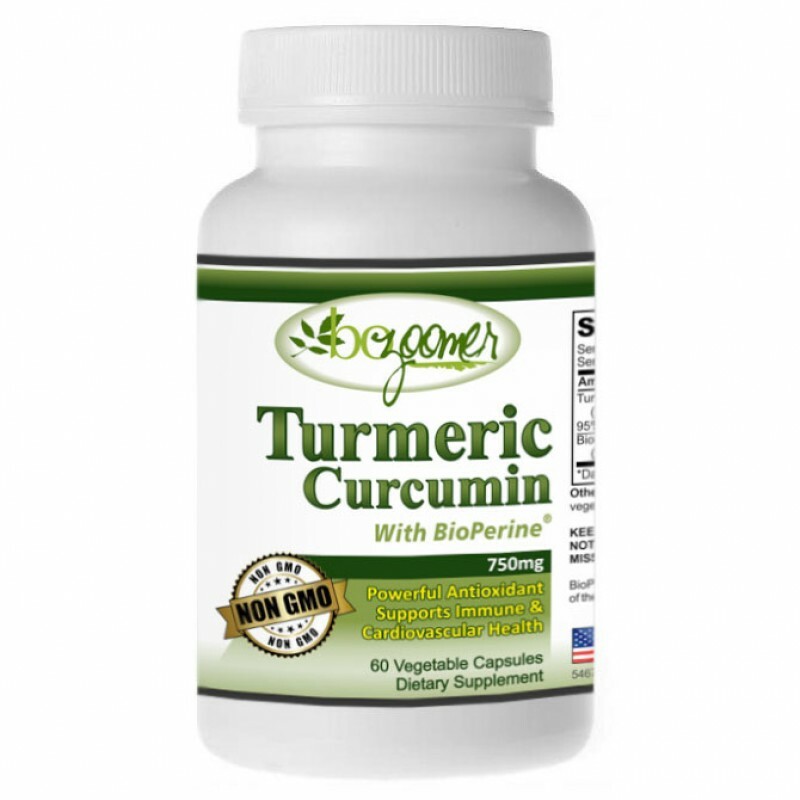 Our Turmeric supplement has 95% curcuminoids making it a more potent pain reliever because of the extracted curcuminoids and made them into a supplement. It’s also important to note that curcumin is absorbed better by the body if you combine it with black pepper. That is why we use BioPerine which is black pepper extract. Turmeric-Curcumin supplements are also being researched for their effectiveness on inflammation and cancer. Inflammation is known to be the beginning stage that can cause cancer and because turmeric is such a strong anti-inflammatory agent, it can really help reduce the risk of cancer. Research studies done on animals are showing that curcuminoids may help stop or prevent the growth of blood vessels that are in tumors which stops the spread of cancer. Inflammation is known to be one of the leading causes of cancer, heart problems, and chronic pain which will cause stress and age the body. When the body is inflamed, there are free radicals that will break down healthy skin cells. This causes wrinkles and decreases the ability of the brain to function properly. Studies are showing Turmeric-Curcumin to be as effective as pharmaceutical drugs that are marketed as anti-inflammatory remedies. Which means, NO harmful side effects to consuming turmeric as you have from other drugs that are non-organic compounds. Besides causing aging, free radicals that are present with inflammation will weaken your body’s first defense, the immune system. People are now taking curcumin to boost the immune system so their body can fight off colds and flus. Turmeric has been found to help reduce and prevent Alzheimer’s. Scientists have found that the brain needs a growth hormone to function properly and turmeric can help to increase the level of this hormone which our body produces less of as we age and may keep Alzheimer’s away. The growth hormone actually creates new neural pathways and connections that cannot form without it. Even the plaque that builds up causing Alzheimer’s is broken down by Turmeric-Curcumin. Understanding the circulatory systems and neurological systems are an essential part of long term health. There are studies that now show curcumins may help prevent Alzheimer’s. NOTE: Want to really help? Stop eating process foods and start taking Turmeric-Curcumin. We know that Heart disease is the leading cause of death in the United States and it can be caused by inflammation and poor blood circulation. Taking Turmeric along with taking Organic Sulfur is a root that allows the blood to flow better by improving the health of the blood vessels. Essentially, the root will help the lining of the blood vessels and this can reduce heart attacks, blood clots, and other heart diseases. Because so many people suffer with blood pressure issues, this supplement or combination is a great way to help lower high blood pressure, inflammation, and reduce hypertension. Arthritis is, essentially, inflammation to an extreme degree as it causes pain in the joints and muscles. Turmeric and Organic Sulfur along with an alkaline diet may help to lower your inflammation that causes joint pain. These results are already proven to be more effective than anti-inflammatory drugs that have undesirable side effects. Inflammation causes oxidative stress (more free radicals than antioxidant defenses) in the body which creates age spots and wrinkles. Turmeric can help you stay looking young and feeling young, too! The objective is that if you look healthy then chances are you’re going to be healthy on the inside and have great energy levels as well. Even if you only suffer from stress, mild depression or mood swings, turmeric can help boost your mood as you realize its amazing benefits. Turmeric has been shown in scientific studies to have as powerful of an effect as Prozac in treating depression. The reason that turmeric helps boost the mood so much is that it releases the hormones in the brain that makes us feel good. These hormones are called dopamine and serotonin. Let’s focus some on maintaining the health of your brain as you age. Could it be that the medical community has a so-called standard of brain care and refuse to look at scientific research for non-medical alternatives? Scientific research has shown that curcumin, an amazing antioxidant compound found in the root of the Turmeric plant, may be one of the most powerful, natural brain-supporting substances ever found. A clinical study involving people with cognitive decline evaluated the effects of curcumin on the brain. The participants taking curcumin had significantly higher levels of dissolved abnormal proteins in their blood. Researchers have been studying for many years the abnormal protein structures in the brain that seem to severely affect the brains function. If this ordinary function fails, defective proteins accumulate in the brain and cognitive decline can follow. When these malformed proteins are formed, the immune system sends out cells known as macrophages, which engulf and destroy the abnormal proteins. This amazing study showed that curcumin has the ability to effectively pass into the brain, and assist the body in the healing. Once inside of the brain, curcumin also goes to work destroying the free radicals that can damage healthy cells. This can provide extremely positive support for an aging brain. Please note: Low-grade inflammation is suspected by many leading experts as the root cause of a many serious health problems, including the development of cognitive decline which can severely impact your quality of life especially as you age. What to look for when purchasing a quality Turmeric-Curcumin is important as it’s impossible to get the therapeutic amount daily as a spice. Unfortunately, most supplements out there don't have the necessary doses and components to get the job done. If you take the wrong supplement, you'll end up not only wasting money, but missing out on an incredible opportunity to combat harmful inflammation and support your cognitive health and wellness. Standardization and Dose: Standardization is the process by which the active ingredients in a plant are concentrated and brought to a consistent level. 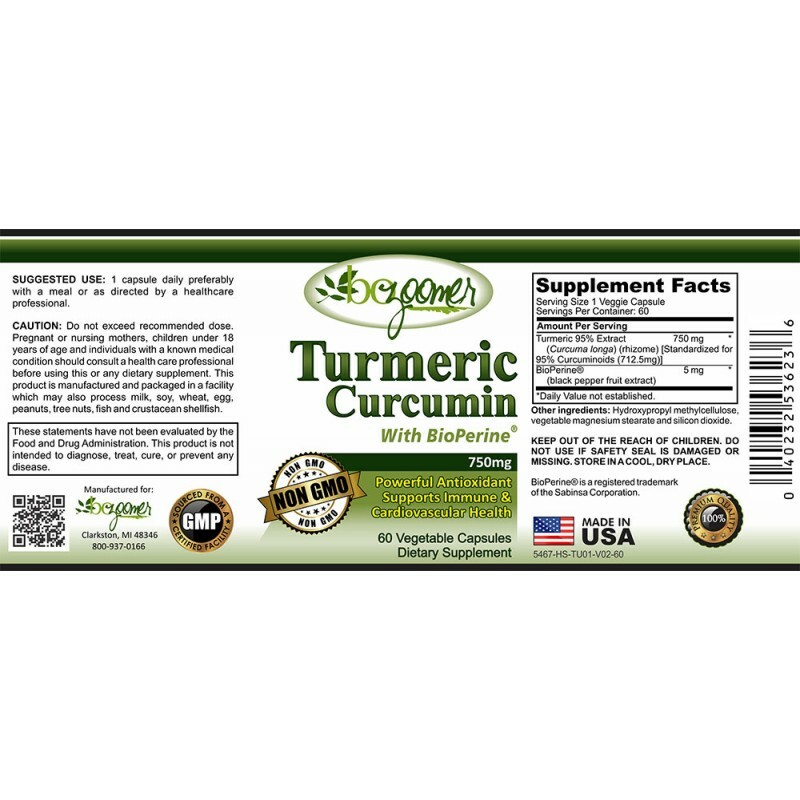 The active ingredients of Turmeric are called curcuminoids component of curcumin. Standardized to a minimum of 75% (bozoomer is 95%). Less than that you getting a pill filled with powered turmeric root is all. Absorption: One problem with Turmeric-Curcumin is that it's not easily absorbed by your body. However, it was discovered that an extract of black pepper, called piperine, significantly enhances absorption of curcumin. In fact, one study found that the addition of a piperine extract increased bioavailability by up to 2,000%. This extract is a must. (bozoomer has this BioPerine extract). Price: Some people mistakenly believe if you pay more you get better quality. You don't need to pay more than $30 for a one-month supply. Many companies are taking advantage of the hype surrounding curcumin and charging much less for low quality or more than double this. (bozoomer offers very good quality and very good pricing with 60 Vegetable capsules). See for yourself and compare.